The Falls Bridge and neighborhood sign mark the entrance to Philadelphia's East Falls neighborhood. 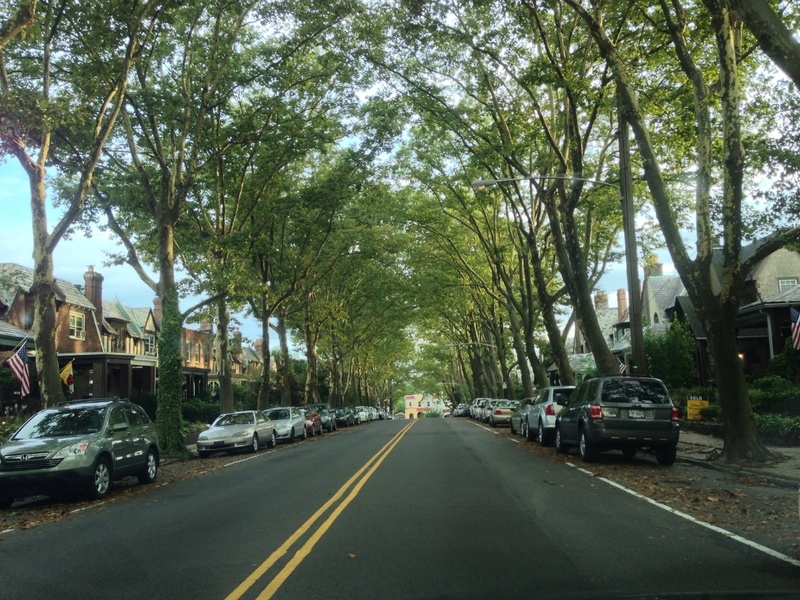 When I moved back to Philadelphia nearly 16 years ago, the first of two neighborhood entries on the home-address resume was a gently renovated, former pizzeria at the corner of 26th and Parrish streets in Fairmount. The oven was run-of-the-mill, but the kitchen still featured a long counter with six old-school stools bolted to the ground. The washer/dryer set in the basement was particularly convenient. The monthly rent for the one-bedroom rental with limited closet space was $650. The neighborhood was constantly abuzz with activity. It featured good people of the old-head and newcomer varieties, buses that got you downtown in 10-ish minutes and a bar, restaurant or store on more or less every corner. It also featured rapidly rising property values, a scarcity of street parking that led to 45-minute pursuits of a spot barely longer than one’s car, frequent-enough crime reports of all varieties and echoes from the Fourth of July fireworks that drove family pets crazy. All things considered, it was a cool spot for a late-20s fella of journalistic-financial standards. But when the clock struck “draw up the homebuying location pro/con chart” o’clock, with marriage and familial expansion looming, the negatives outweighed the positives. Four hundred large for a place that, at best, might have a driveway wasn’t happening. So, the question facing my bride-to-be and I – both insistent on remaining within the city limits – was simple: To what neighborhood should we move? It didn’t take long to find the correct answer. With a word-of-mouth, no-sale-sign-posted tip up our sleeves, we made our way up Kelly Drive, a 4-mile reminder of nature’s role in an urban setting. We cut a right on Midvale Avenue and drove by that humungous red-pepper icon outside Johnny Manana’s, under a Regional Rail bridge and passed by a pharmacy, corner store and a public school with a stately clock tower. Then, we cut a left onto a residential block featuring a picturesque green London plane-tree canopy. I’m pretty sure my jaw dropped as visions of young Hickeys growing up in the suburbs but not actually being relegated to suburban life danced in my head. All of which is to say I/we was/were sold on East Falls as the best neighborhood for a growing family in Philly before we even opened the front door of the home we’d soon buy. This is 2015, and I’ll tell you what: My jaw still drops when those trees out front are in full bloom (not so much when I have to rake leaves 10 times each fall, but it’s still worth it). There are many reasons for this. I’ll break them down into nine categories for you, none of which include the fact that this steeped-in-history area was Princess Grace Kelly’s childhood home. The previously aforementioned Kelly Drive commute offers – on good days – a reminder that nature (the Schuylkill River and Fairmount Park) is a healthy part of the city’s ecosystem. It also offers a refreshing alternative to the Schuylkill Expressway. If highways are your thing (of necessity), neighborhood on-ramps offer quick and easy access to both Route 1 and I-76. Which offer access to the Pennsylvania Turnpike and I-95. Which offer access to the whole dang country! Oh yeah, I almost forgot about the growing population of folks who prefer bicycles and trains to automobiles. Well, Kelly Drive is a bicycling commuters’ dream, and, from East Falls Station, the Norristown Regional Rail line offers a 21-minute ride to Center City and 30-minute lift to 30th Street Station. All of which is to say this cozy community of mine may well be perfectly situated geographically (especially the portions atop the hill that needn’t face flooding because water runs downhill to, like, Kelly and Midvale, which – full disclosure – can get a little waterlogged sometimes). Bicyclists, joggers and walkers can always be seen along Kelly and MLK drives. McDevitt Recreation Center and its recent six-figure revamp bolstered growing neighborhood youth sports programs (I’ll put the 5- and 6-year-olds I coach up against any similarly aged soccer squad in the city, yo) and brought a sprayground! McMichael Park (and its turtle statue) offers a refreshing swath of green space, mid-hood. There’s swimming at the nearby Salvation Army Kroc Center or at Penn Charter. There’s rock climbing along Scotts Lane. There’s a table-tennis club at the Falls Center. There are gyms – of both the locally owned and chain varieties – within walking distance. There’s an annual Dance on the Falls Bridge. And then there’s always the Rocky-steps-like workout inherent in a stroll up Midvale Avenue toward Henry. 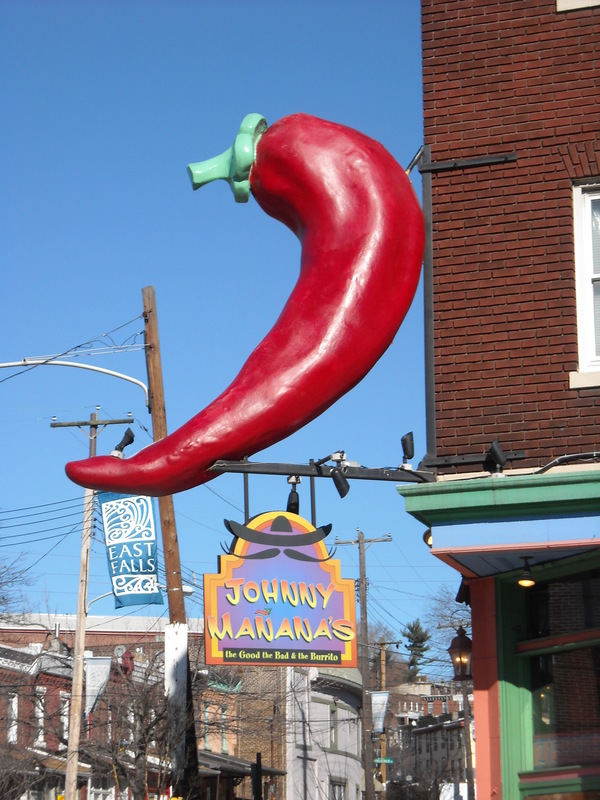 In Johnny Manana’s, we have Mexican grub. In Major Wing Lee’s, we have ridiculously well-priced hoagies. In Billy Murphy’s Irish Saloonery, we have the best damn burgers in Philly (not to mention Wing Night). In Frank’s and Slices Pizza, we, respectively, have some quality delivery. In Laxmi’s Indian Grille, we have Tandoori chicken (and more). And, in Fiorino, we have the city’s hidden culinary gem. One bite of their gnocchi dish will make you forget anything you once considered the best food you’ve eaten. Oh yeah, we even have our own supermarket. On the beverage side of things: Manana’s brings the margaritas, Murphy’s brings the corner-bar sips (as does Cranky Joe’s right across the street and Franklin’s right around the corner). Beer-snobbier than those spots? Check out Falls Taproom at the bottom of the hill. Sure, there’s no club scene here in the Falls. But there’s little demand for it either. I mean, Manayunk is right next door, and Regional Rail can get you within eyeshot of Old City if that’s your kind of thing. East Falls is home to William Penn Charter, Philadelphia University and Drexel School of Medicine. It’s also the place where many students from Temple and Saint Joseph’s universities call their off-campus rental homes. This is the category where it gets a little trickier for wee lads and lasses, though. When St. Bridget School closed in 2012, it left a noteworthy impact on educational options in the Falls. But Thomas Mifflin School – home of the stately clock tower at Midvale Avenue and Conrad Street and some really cool crossing guards – is still here, and despite some issues between school and community in the past, an effort to unite the two continues. The Friends of Mifflin School group speaks to the neighborhood’s level of community engagement insofar as it’s an effort to support the catchment-zone mainstay and ultimately lead to more incoming families sending their children there instead of to charter or other public schools not in the neighborhood. It’s an ongoing process and, hopefully, one that will foment a culture of unity. This sounds about right two years later. In 2005, our home fell smack dab in the middle of that rowhouse range, and prices on the block for homes up for sale tend to remain in that area. As for the other side of Midvale, stretching up Warden Drive from the Falls of Schuylkill Library past one of the best sledding hills this side of the Poconos and Philadelphia University, up toward the pristine little nook of gorgeous homes on Netherfield Drive, there are some big-money mansions that also fall into the East Falls footprint. All told, you can find homes of all financial shapes and sizes here, which helps explain why professionals both new and established and families both large and just starting to grow call themselves Fallsers. Remember how I mentioned our whole issue with parking in Fairmount and how it played a role in our move from Fairmount to East Falls. Yeah, no. That doesn’t happen here. On our block, both sides of the street have alley-accessible driveways and $35/annual residential parking permits that keep most of the blocks unjammed. If it’s the little things that matter most, this is an important little thing. Yep, the former Philadelphia mayor, governor of Pennsylvania and civic cheerleader is a resident and big fan of the neighborhood, too. "There are so many things to love about East Falls," he said during a recent chat with PhillyVoice. First and foremost, he cited its "perfect location" to highways and shopping in Chestnut Hill or on City Line Avenue, along with trains and roads that get residents down to Center City. Rendell's pro-Falls list moved on into the fact that a similarly sized home costs "60 to 75 percent of what it would cost in Chestnut Hill" and there are restaurants like In Riva, gathering places like the Falls of Schuylkill Library branch, Christmas caroling in McMichael Park, trick-or-treating through the neighborhood on Halloween and a "real sense of community" he's felt in East Falls during his years here. He also cited the neighborhood's diversity as a major selling point. From high-end houses tucked away off the beaten path like that which the late U.S. Sen. Arlen Specter called home to the Abbottsford Homes public housing complex off Ridge Avenue, East Falls is representative of the city in its entirety, he said. "You get to meet all types of people who call East Falls home," he said, noting that community spirit transcends racial and class lines here. "You just have everything in this neighborhood." Oh yeah, I’d be remiss not to mention that the neighborhood is home to one of the best dang Quizzo Nights on earth, and I’m not just plugging that because I’m the host. Oh – who am I kidding? – yes, I am. And, finally, from Mike Murphy: "It's the only affordable neighborhood in the city that is clean and the neighbors are proud. Close proximity to every major roadway in the city. The R6 will get you anywhere you need to be if you don't have a car. We have some of the best restaurants and bars in the city, and it feels like home. East Falls is a hidden gem in the city. The strongest politicians reside here along with our union brothers that build it. 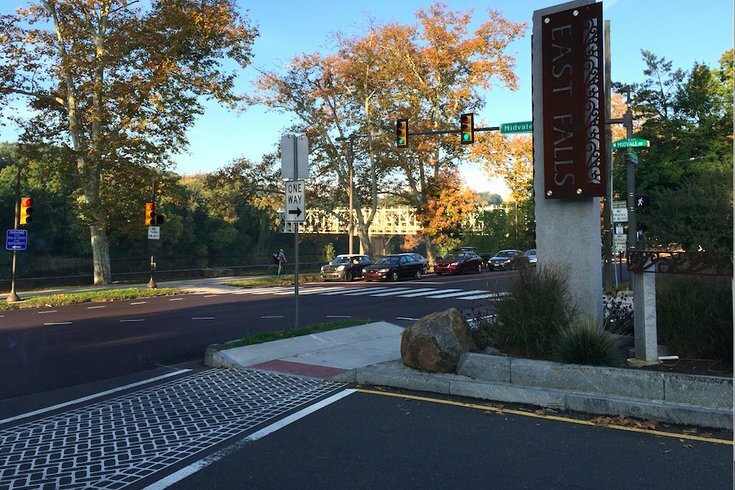 East Falls runs Philadelphia and I'm proud to say I've lived here for 15-plus years."